The primary pathologic sites are the sacroiliac joints, the bony insertions of the annulus fibrosis of the intervertebral discs, and the apophyseal joints of the spine. Ankylosing Spondylitis (AS) also known as Marie- Strumpell disease or bamboo spine, is an inflammatory arthropathy of the axial skeleton, usually involving the sacroiliac joints, apophyseal joints, costovertebral joints, and intervertebral disc articulations. AS is a chronic progressing inflammatory disease that causes inflammation of the spinal joints that can lead to severe, chronic pain and discomfort. In advanced stages, the inflammation can lead to new bone formation of the spine, causing the spine to fuse in a fixed position often creating a forward stooped posture. The vertebral column exists of 24 vertebrae: seven cervical vertebrae, twelve thoracic vertebrae and five lumbar vertebrae. The vertebrae are joined together by ligaments and separated by intervertebral discs. The discs exist of an inner nucleus pulposus and an outer annulus fibrosis, consisting of fibrocartilage rings. AS is 3 times more common in men than in women and most often begins between the ages of 20-40. (Level 5) Recent studies have shown that AS may be just as prevalent in women, but diagnosed less often because of a milder disease course with fewer spinal problems and more involvement of joints such as the knees and ankles. Prevalence of AS is nearly 2 million people or 0.1% to 0.2% of the general population in the United States. It occurs more often in Caucasians and some Native American than in African Americans, Asians, or other nonwhite groups. AS is 10 to 20 times more common with first degree relatives of AS patients than in the general population. The risk of AS in first degree relatives with the HLA-B27 allele is about 20%. There can also be buttock, or hip pain and stiffness for more than 3 months in a person, usually male under 40 years of age. It is mostly worse in the morning, lasting more than 1 hour and is described as a dull ache that is poorly localized, but it can be intermittently sharp or jolting. Overtime pain can become severe and constant and coughing, sneezing, and twisting motions may worsen the pain. Pain may radiate to the thighs, but does not typically go below the knee. Buttock pain is often unilateral, but may alternate from side to side. Paravertebral muscle spasm, aching, and stiffness are common, making sacrioliac areas and spinous process very tender upon palpation. A flexed posture eases the back pain and paraspinal muscle spasm; therefore, kyphosis is common in untreated patients. Enthesitis (inflammation of tendons, ligaments, and capsular attachments to bone) may cause pain or stiffness and restriction of mobility in the axial skeleton. Dactylitis (inflammation of an entire digit), commonly termed “sausage digit,” also occurs in the spondyloarthropathies and is thought to arise from joint and tenosynovial inflammation  Level 5. Since AS is a systemic disease an intermittent low grade fever, fatigue, or weight loss can occur. In advanced stages the spine can become fused and a loss of normal lordosis with accompanying increased kyphosis of the thoracic spine, painful limitations of cervical joint motion, and loss of spine flexibility in all planes of motion. A decrease in chest wall excursion less than 2 cm could be an indicator of AS because chest wall excursion is an indicator of decreased axial skeleton mobility. In the early stages of ankylosing spondylitis, the changes in the sacroiliac joint are similar to that of rheumatoid arthritis, however the changes are almost always bilateral and symmetrical. This fact allows ankylosing spondylitis to be distinguished from psoriasis, Reiter's syndrome, and infection. Changes at the sacroiliac joint occur throughout the joint, but are predominantly found on the iliac side. 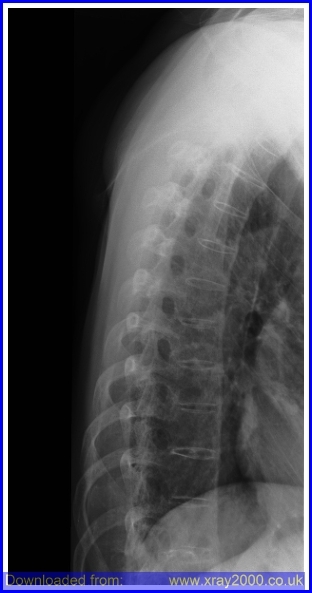 AS can be diagnosed by the modified New York criteria, the patient must have radiographic evidence of sacroiliitis and one of the following: (1) restriction of the lumbar spine motion in both the sagittal and frontal planes, (2) restriction of chest expansion (usually < 2.5 cm) (3) a history of back pain includes onset at <40 year, gradual onset, morning stiffness, improvement with activity, and duration >3 months. X-rays. 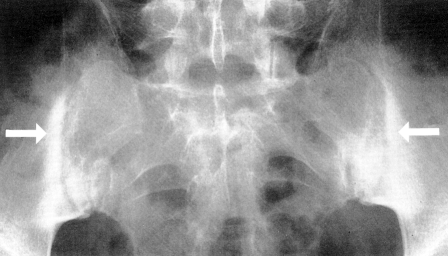 Radiographic findsing of symmetric, bilateral sacroiliitis include blurring of joint margins, extaarticular sclerosis, erosion, and joint space narrowing. As bony tissue bridges the vertebral bodies and posterior arches, the lumbar and thoracic spine creates a “bamboo spine” image on radiographs. Computerized tomography (CT). CT scans combine X-ray views taken from many different angles into a cross-sectional image of internal structures. CT scans provide more detail, and more radiation exposure, than do plain X-rays. Lab tests. There is no laboratory test to diagnose ankylosing spondylitis but the HLA-B27 gene has been found to be present in about 90 to 95 percent of affected white patients in central Europe and North America  Level 5. The presence of the HLA-B27 antigen is a useful adjunct to the diagnosis, but cannot be diagnostic alone. Physical examination of the spine involves the cervical, thoracic and lumbar region. The thoracic spine can be tested by the chest expansion. It is measured at the fourth intercostal space and in women just below the breasts. The patient should be asked to force a maximal inspiration and expiration and the difference in chest expansion is measured. A chest expansion of less than 5 cm is suspicious and < 2.5 cm is abnormal and raises the possibility of AS unless there is another reason for it, like emphysema. The normal thoracic kyphosis of the dorsal spine is accentuated. The costovertebral, costotransverse and manubriosternal joints should be palpated to detect inflammation which causes pain on palpitation. Requirement of a multidisciplinary treatment coordinated by the rheumatologist. The primary goal is to maximise long term health-related quality of life. Therefore it is important to control symptoms and inflammation, prevent progressive structural damage, preserve/normalise function and social participation. The treatment should aim at the best care and requisites a shared decision between the patient and the rheumatologist. A combination of non-pharmacological and pharmacological treatment modalities is required. The present manifestations of the disease (peripheral, axial, entheseal, extra-articular symptoms and signs). The level of current symptoms, prognostic indicators and clinical findings. The general clinical status (gender, age, comorbidity, psychosocial factors, concomitant medications). Patient education and regular exercise form the cornerstone of non-pharmacological treatment of patients with AS. Home exercises are effective. However, physical therapy with supervised exercises, land or water based, individually or in a group, should be preferred as these are more effective than home exercises. Self-help groups and patient associations may be useful. Psoriasis, uveitis and IBD are some of the frequently observed extra-articular manifestations. They should be managed in collaboration with the respective specialists. Rheumatologists should be aware of the increased risk of cardiovascular disease and osteoporosis in patients with AS. For AS patients with pain and stiffness, NSAID, including Coxibs, are recommended as first-line drug treatment. For patients with persistently active, symptomatic disease, continuous treatment with NSAID is preferred. 6. Analgesics: after previously recommended treatments have failed, are contraindicated, and/or poorly tolerated. According to the ASAS recommendations, anti-TNF therapy should be given to patients with persistently high disease activity despite conventional treatments. Shifting to a second TNF blocker may be beneficial, especially in patients with loss of response. No evidence exists to support the use of biological agents other than TNF inhibitors in AS. In patients with refractory pain or disability and radiographic evidence of structural damage, independent of age, total hip arthroplasty should be considered. In patients with severe disabling deformity, spinal corrective osteotomy may be considered. A spinal surgeon should be consulted in patients with AS and an acute vertebral fracture. 9. Changes in the disease course: Other causes than inflammation (eg. spinal fracture) should be considered if a significant change in the course of the disease occurs and appropriate evaluation, including imaging, should be performed. A multimodal physical therapy program including aerobic, stretching, education and pulmonary exercises in conjunction with routine medical management has been shown to produce greater improvements in spinal mobility, work capacity, and chest expansion compared with medical care alone. Evidence showed that aerobic training improved walking distance and aerobic capacity in patients with AS. However, Aerobic training did not provide additional benefits in functional capacity, mobility, disease activity, quality of life, and lipid levels when compared with stretching exercises alone (Jennings et al, 2015). Evidence also showed that passive stretching resulted in a significant increase in the range of movement (ROM) of the hip joints in all directions except flexion during the physiotherapy course. This increase in ROM could be maintained by patients who performed the stretching exercises on a regular basis  Level 1B. Since the severity of AS is very different among individuals, there is no specific exercise program that showed the greatest improvements. Some studies showed that a 50 minute, three times a week multimodal exercise program showed significant improvements after 3 months in chest wall excursion, chin to chest distance, occiput to wall distance, and the modified Schober flexion test. Physiotherapy and rehabilitation should start as soon as AS is diagnosed. Physiotherapy should be planned according to the patients’ needs, expectations and clinical status, as well as be commenced and monitored properly. Physiotherapy should be performed as an inpatient or outpatient program in all patients, regardless of disease stage, and should be carried out in obedience with general rules and contraindications. As mentioned before, the conventional protocols of physiotherapy including stretching, flexibility and breathing exercises, as well as pool and land-based exercises and accompanying recreational activities are recommended. Walking, treadmill, cycling or swimming for a progressive duration on the basis of the patient’s functional capacity (low speed, without resistance). Aquatic therapy can be an excellent option for most patients to provide low impact extension and rotation principles. Exercises that should be avoided include high impact and flexion exercises. Over exercising can be potentially harmful and could exacerbate the inflammatory process. 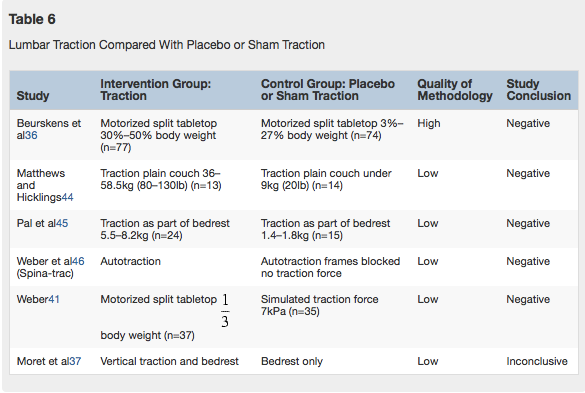 Some have advocated the efficacy and use of gentle non-thrust manipulation in the spine. Dagfinrud, H., Hagen, K. B., & Kvien, T. K. (2008). Physiotherapy interventions for ankylosing spondylitis. The Cochrane Library. Chang, W. D., Tsou, Y. A., & Lee, C. L. (2016). Comparison between specific exercises and physical therapy for managing patients with ankylosing spondylitis: a meta-analysis of randomized controlled trials. INTERNATIONAL JOURNAL OF CLINICAL AND EXPERIMENTAL MEDICINE, 9(9), 17028-17039. Liang, H., Zhang, H., Ji, H., & Wang, C. (2015). Effects of home-based exercise intervention on health-related quality of life for patients with ankylosing spondylitis: a meta-analysis. Clinical rheumatology, 34(10), 1737-1744. O’Dwyer, T., O’Shea, F., & Wilson, F. (2014). Exercise therapy for spondyloarthritis: a systematic review. Rheumatology international, 34(7), 887-902. Martins, N. A., Furtado, G. E., Campos, M. J., Ferreira, J. P., Leitão, J. C., & Filaire, E. (2014). Exercise and ankylosing spondylitis with New York modified criteria: a systematic review of controlled trials with meta-analysis. Acta Reumatológica Portuguesa, 39(4). Nghiem, F. T., & Donohue, J. P. (2008). Rehabilitation in ankylosing spondylitis. Current opinion in rheumatology, 20(2), 203-207. Fernandez-de-las-Penas, C., Alonso-Blanco, C., Aguila-Maturana, A. M., Isabel-de-la-Llave-Rincon, A., Molero-Sanchez, A., & Miangolarra-Page, J. C. (2006). Exercise and ankylosing spondylitis—which exercises are appropriate? A critical review. Critical Reviews™ in Physical and Rehabilitation Medicine, 18(1). Stasinopoulos, D., Papadopoulos, K., Lamnisos, D., & Stergioulas, A. (2016). LLLT for the management of patients with ankylosing spondylitis. Lasers in medical science, 31(3), 459-469. Karamanlioğlu, D. Ş., Aktas, I., Ozkan, F. U., Kaysin, M., & Girgin, N. (2016). Effectiveness of ultrasound treatment applied with exercise therapy on patients with ankylosing spondylitis: a double-blind, randomized, placebo-controlled trial. Rheumatology international, 36(5), 653-661. Jennings, F., Oliveira, H. A., de Souza, M. C., da Graça Cruz, V., & Natour, J. (2015). Effects of Aerobic Training in Patients with Ankylosing Spondylitis. The Journal of rheumatology, 42(12), 2347-2353. Niedermann, K., Sidelnikov, E., Muggli, C., et al. (2013) Effect of cardiovascular training on fitness and perceived disease activity in people with ankylosing spondylitis. Arthritis care & research, 65(11), 1844-1852. Spondyloarthropathy is a group of multisystem inflammatory disorders affecting various joints including the spine, peripheral joints and periarticular structures. They are associated with extra-articular manifestations (for example a fever). The majority are HLA B27 positive (serological test) and Rheumatoid Factor (RF) negative. 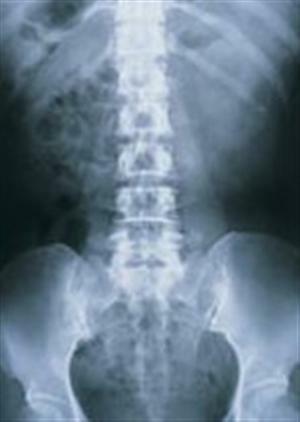 Sacroiliitis is a common manifestation in all of these disorders. Although a triggering infection and immune mechanisms are thought to underlie most of the spondyloarthopathies, their pathogenesis remains obscure. Physical examination of the spine involves the cervical, thoracic and lumbar region. The physician may ask the patient to bend the back in different ways, check the chest circumference and also may search for pain points by pressing on different portions of the pelvis. In doubt the physician effects different diagnostic procedures such as X-ray imaging, HLA B27 presence, CRP levels in blood samples. Physiotherapy is the best known non surgical therapeutic way of treating AS improving flexibility and physical strength. Surgery is only recommended in patients with chronic cases Most cases can be treated without surgery. ↑ 5.0 5.1 5.2 5.3 5.4 5.5 Beers MH, et. al. eds. The Merck Manual of Diagnosis and Therapy. 18th ed. Whitehouse Station, NJ: Merck Research Laboratories; 2006.